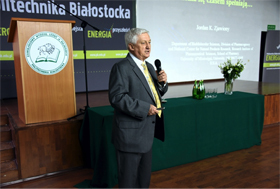 new center devoted to natural products research was dedicated Nov. 10 at Bialystok University of Technology in Poland, due in part to collaboration with the University of Mississippi School of Pharmacy. Located in Hajnowka and funded by the European Union, the state-of-the-art Scientific and Research Centre is overseen by Bialystok’s Faculty of Forestry. The center is strategically located near one of the oldest forests in Europe. Bialowieza Forest, which is 7,000 years old, holds great potential for the discovery of new natural products. Zjawiony, who has worked with natural products for 26 years, was instrumental in the development of the center. He delivered a keynote address at the center’s opening. Zjawiony gives a keynote address at the Scientific and Research Centre’s opening in November. Bakier said the center will provide a wide range of research possibilities. 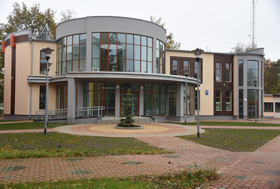 Zjawiony will further collaborate with Bialystok and the new center through a three-year project funded by a grant from the National Science Foundation (grant no. 1459504). The grant allows groups of UM students to travel to Europe each summer to conduct research in the Bialowieza Forest alongside Bialystok students and scientists. The first year of the project went very well, Zjawiony said. Visit us at pharmacy.olemiss.edu, Facebook, Twitter, Flickr, Pinterest and Instagram.